In Goa we call these pakodas as bhaji. We love to have these with plain rice and amlechi uddamethi. For every festival we make these pakodas and love to have them on the veg days. You can even serve them with Jeera rice. Apply salt and chili powder to the cauliflower florets and potato slices, keep aside for 15 mins. Mix the gram flour with 1 cup water to make a thick batter. Ensure that there are no lumps. Add salt as per your taste to the batter keeping in mind that salt has also been added to the cauliflower florets and potato slices. Mix all the other ingredients listed above(ajwain, coriander leaves, cooking soda) except cauliflower and potato. Heat oil in a kadai and wait for it to reach the right temperature. You can check this by dropping a pinch of batter in the oil. It will get fried if the oil is set to the right temperature, else it will stick to the bottom of the kadai. Dip the cauliflower in the batter and gently drop them in the kadai with hot oil. Do the same with potato. At a time 4-5 pakodas can be fried. Spread them onto a tissue paper. Tissue paper will absorb the extra oil. Serve hot with chutney of your choice or tomato sauce or have them plain. thank you for visiting my blog………u hav a nie blog……….happy 2 follow u……..
Looks crispy and crunchy . I prepared those yesterday. Perfect snack time with tea. Yum!Yum! 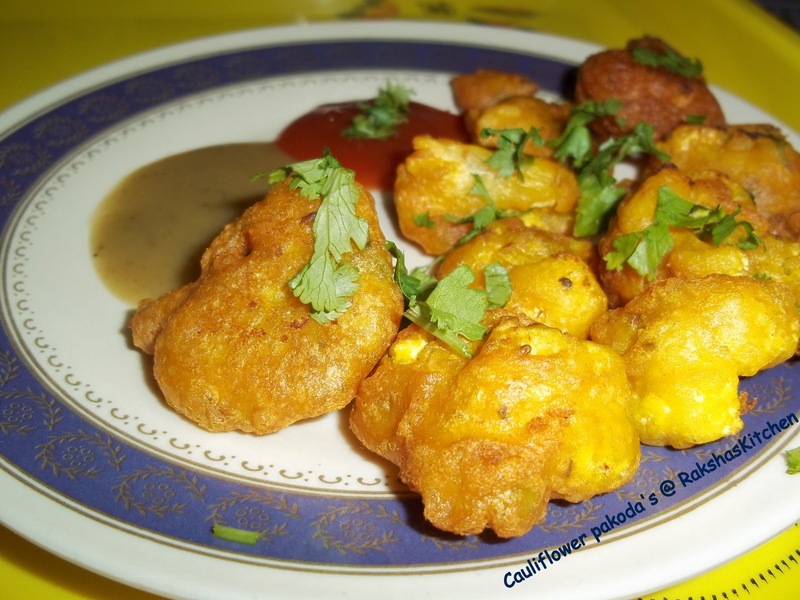 Hot potato and cauliflower pakodas look gorgeous. pakoda looks so crispy and delicious.. Delicious pakoras… perfect evening snack. Yummy…this looks and sounds so delicious! Firt time to ur space. Lovely pakodas.